marginalising Igbo people. He also assured the Igbo of a seaport in Onitsha if re-elected. He announced that the River Niger portion in Onitsha would be among the rivers that would be dredged for seaports in his second term. Others, he said, included Warri and Lokoja, which he said when done, would decongest the Lagos seaport and open economic activities in Anambra and the South-East in general. 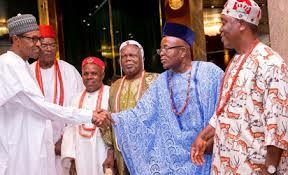 Buhari made this pledge at an interactive session with traditional rulers and presidents-general of Anambra communities at the palace of the Obi of Onitsha on Thursday during his campaign visit to the state. 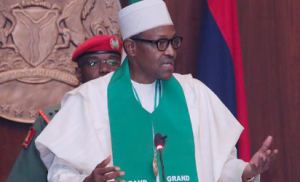 He said, “My government is determined to complete the ongoing federal projects in the state, especially the Second Niger Bridge and the Enugu-Onitsha Expressway. “It’s not true that my government is marginalising the Igbo. The five eastern states are represented in my cabinet. Every appointment was based on fairness to accommodate every state. Buhari said his appointment of security chiefs was based on merit not sentiments. He stated, “Those of you who were in the military, even in the Biafran Army, know that the entry point is the same and you go for basic training, until you go to your formations or institutions, whether it is Army, Navy, Air Force or the police. The most competent or senior person is the one that gets there. "I assure the people of the South-East of the completion of the ongoing roads and rail projects in the geopolitical zone in my second term. “We regret that most of the roads are in deplorable conditions as a result of serial abandonment by previous governments.